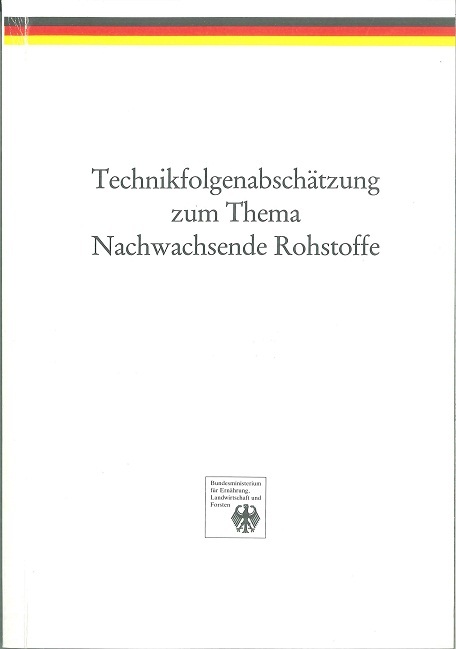 In the technology assessment study conducted at the request of the German Ministry of Research and Technology, different groups of energy carriers, chemical raw materials, and other types of plant-derived industrial material were examined from technical, economic, ecological, and social points of view for any detectible advantages and disadvantages or chances and risks. The starting point for this was the reference year 1990. By developing and using various scenarios, the medium-term perspectives were estimated for the year 2005. The work was completed with the publication of the results in book form in 1993. Furthermore, the detailed background information for the entire study, which was compiled by external experts or groups of experts, was documented in 36 volumes of material. Decisive for the economic evaluation is the fact that renewable resources for energy will not become competitive until the fossil energy carriers that are being replaced reach the energy price level referred to as the threshold price. The smaller the respective distance to the threshold price, the smaller are the CO2 mitigation costs. Relatively economically efficient options for reducing CO2 are available if the threshold price is clearly under 100 DM/MWh. The future prospects for (domestic) renewable energy carriers from a macroeconomic perspective are greater for product lines that use solid renewable energy carriers to access the heating market than for ethanol, methanol, and rapeseed oil. As a rule, in many sectors of the heating and combined heat and power market these liquid energy carriers produce a lower yield per hectare (ha), a less favorable net energy balance, a lower net reduction in CO2 per hectare, higher CO2 mitigation costs, and higher feasible energy prices (threshold prices) for fossil energy carriers than is the case for solid renewable energy carriers. An advantage of the liquid energy carriers (especially of rapeseed oil) is the fact that it can be introduced technologically relatively rapidly into the fuel and heating markets, assuming the relevant subsidies are available. There are, in contrast, two disadvantages hemming the solid renewable energy carriers. First, more time is needed for research, development, and demonstrations. Numerous questions in the field of crop farming (especially miscanthus), harvesting, drying, compaction, logistics, and the technologies utilizing these energy carriers need to be clarified further. Second, the potential for the heating and combined heat and power market to absorb it is growing slowly. The pace of this growth is also determined by the regeneration times of steam generators and combined heat and power plants and by the extension of district heating. A further focus of the study was estimating the market potential for the different groups of product lines of renewable energy carriers and analyzing the impact on employment and income. With a view to the market potential, the study reaches the following assessment. The medium-term market potential of renewable resources for energy depends decisively on whether the advantage of achieving a reduction in CO2 will produce an economic reward and when it will be possible to access visible technical opportunities for utilizing solid fuels in plants for the cogeneration of heat and power and for conducting successful demonstrations. According to the study's estimates, some 15 to 35 million tons of solid fuel from plants could ideally be used by the energy market by 2005. The vast majority of it could consist of straw and other plant residual materials (especially forest residues). The amount of land additionally necessary for growing energy plants until 2005 would be minimal (presumably not more than some 3% of the agricultural land). It is only in the longer term (in 20-40 years) that the availability of cropland would replace the pace of marketability as the decisive factor restricting expansion. The market potential in the chemical-technical area will be primarily determined in the medium term by plant-based oil and starch. The raw material segments of sugar, plant fiber, and medicinal and spice plants will occupy approximately 30,000 ha more by the end of the period of time under consideration in 2005 than at present. The medium-term market potential of sugar and starch will more probably be in the technical field than in that of chemical raw materials. Overall in Germany, some 0.2 to 0.6 million ha more than currently could be taken by renewable resources for the chemical-technical field by 2005 at customary production intensity. This amounts to 1.1% to 3.3% of the agricultural land. Reforestation could lead to an additional 0.8% to 1.6% of agricultural land being used for wood, the oldest renewable resource. Proceeding from the values given above for the market potential of several types of renewable resources, we estimated an additional need for workers at between 20,000 and 60,000 full-time staff. Just as was true of its impact on employment, the significance of the impact of renewable resources on income should not be overestimated for rural areas. Wintzer, D.; Fürniß, B.; Klein-Vielhauer, S.; Leible, L.; Nieke, E.; Rösch, Ch. ; Tangen, H.